Union Public Service Commission has released Personality Test Program or Interview Schedule of UPSC ACPF Exam 2014 on the official website. These qualified candidates will be called for Personality Test / interview of candidate which will be conducted from 9th February to 13th February 2015. Interview Call Letters/ e-summon Letters of short listed candidates has been sent to their respective address.Interview will be schedule on forenoon & Afternoon Session. The reporting time for forenoon session is at 9:00 AM and After Noon Session is at 1:00 PM. Candidate must reach at the venue of interview on time. If they fail, they will be treated as absent. 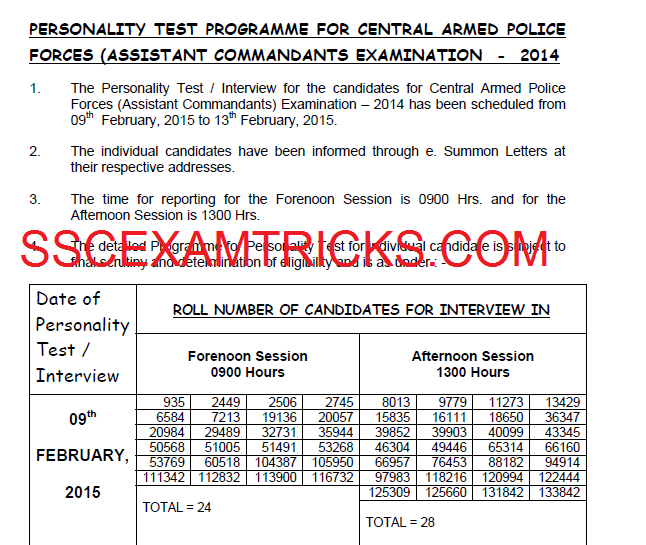 The qualified candidates of UPSC ACPF Exam 2014 will be called for 2nd stage which is interview stage. Click here to download complete detail of Selection Process of UPSC AC 2014 in PDF.